I used to have Ethernet cables running around my office to connect up several computers that I owned. There was no Wifi at home. This is from the cable modem that we receive our internet connection with. I even had an Ethernet cable running from my office out the door , along the walls and over to the couch so that I could multi task at night. This included watching my favorite show or at least being in the same room as my wife in the evening. While I kept track of email or played a game or kept up with Twitter and Facebook. Now with WiFi all of the cables are gone and my wife is happier since there are no cables running around the room. She still is not happy about my multi tasking when we are supposed to be spending time together. Oh Well. It was pretty simple as well. The cable company came and replaced the old modem which had only Ethernet connections with one that had Ethernet and WiFi capability. I do not even use the Ethernet any more preferring to use the WiFi when I am at home regardless of what room I am in, including the office. Wi-Fi products from all manufacturers are easy to connect together. The Wi-Fi Alliance has awarded more than 11,000 product certifications to devices that have been tested for interoperability. This ensures that they are good neighbors to other Wi-Fi equipment. This means that they won’t interfere with operation in other products that you have in your home. 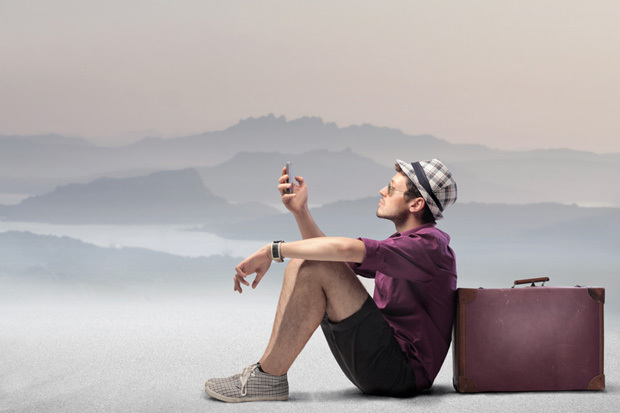 Or while you are traveling about outside of the home with your WiFi enabled computer.Many coffee shops now have WiFi for their customers , although some limit the connection time to 2 hours. All Wi-Fi CERTIFIED products have been tested to operate well on wireless networks. They contain the latest security features to protect users who are connecting to the Internet over the WiFi network. Is Wifi at home for Me? If you want to avoid having unsightly cables running around your home, WiFi is definitely for you. That really is the main reason for WiFi. It allows you to roam around your home or office within specific distances and still be on the internet. Upstairs, in the basement, out side on the driveway or in the backyard. Best reception for WiFi devices is found when you locate the WiFi in the center of your home or as close to that as you can. Some people have had weak signals if they locate the modem in the basement and they are at te other extreme end of the house. Everyone can use Wi-Fi, almost anywhere in the world, in coffee shops, in their homes, even at the office. We will discuss WiFi more for business in the next post. Home Wi-Fi networks act as a gateway to the internet. As well as they can connect multiple devices to each other, to audio and video content, and to the Internet via a single high-speed connection. 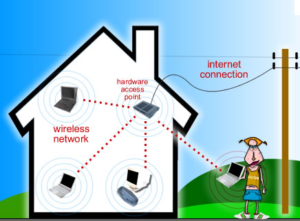 A Wi-Fi network can connect a family’s computers, media and display devices together. There are no cables to share hardware and media resources such as printers, audio files and Internet access. We think that just getting rid of the cables and being able to wander around the house or yard with your computer, your smart phone or iPod is a real bonus. You are still be connected and it is by far the most advantageous benefit for having WiFi in the home. If you have similar ideas or thoughts about WiFi at home, please leave us a comment. All helpful and thoughtful comments will be approved. We will even approve a link to your web site if you provide a quality comment that is interesting and helpful to our readers. For more information about using WiFi in your home, click here. Wi-Fi has become almost universal for business applications these days as a means of enhancing productivity as well as controlling costs. It does not matter whether you are a small business owner or a multi-national corporation. There are excellent reasons for using WiFi in the office as well as making it available for your staff who work out of the home. Is WiFi for Me? We have discussed WiFi in several other posts. If you need more information check out our posts about What is Wifi and How does WiFi technology work? Assuming that you either already know something about WiFi or have read the articles mentioned above, we will plunge right in. Network security is a big thing for corporations of any size. No one wants outsiders to break into your network and do damage or steal your secrets. WiFi does not make it easier or harder to do this , although many people would argue this point. Security for the office is really about making sure that you have your network behind a strong firewall. This is needed to protect you from hackers coming in though the network. It is also about strong passwords on all devices including your wireless modems that prevent unauthorized users from gaining access to your wireless network. IT administrators need to manage security very closely regardless of whether you use WiFi or not. Each device connecting via WiFi connection must be password protected. Each device must also have to enter a secure password to enter when connecting to the WiFi network. Most IT managers will want to hard wire via Ethernet cable all desk top computers to the network to deliver connection to the corporations internal network and also the internet. They feel that this is somehow more secure and delivers better performance. In addition, they will enable WiFi so that all laptops can connect via WiFi when they are moving around the office to meetings etc and / or connect via Ethernet cables. Utilizing a WiFi network in this manner provides a much better and flexible communications capability for employees and enables increased productivity as well. Many employees are provided with smart devices or have their own. These devices may or may not be allowed on the corporations network. But they can connect through the WiFi network to obtain their emails and keep their calender’s up to date etc.. Using the WiFi network for this purpose will significantly reduce the mobile data traffic and your monthly bill from the mobile companies! Wi-Fi products can be used to extend standard wired Ethernet networks to public areas like meeting rooms, training classrooms and large auditoriums. Wi-Fi networks also work well for small businesses, providing connectivity between mobile salespeople, floor staff and behind-the-scenes finance and accounting departments. Because small businesses are dynamic, the built-in flexibility of a Wi-Fi network makes it easy and affordable for them to change and grow. Whether it is an employee from another city or a vendor paying a sales call, providing WiFi at your work location will be appreciated. Many companies will provide a second WiFi network in common areas such as conference rooms that only allow access to the public internet. This prevents a guest from access corporate servers and getting into places they should not be allowed. Many corporations also provide wireless networks to their off-site and telecommuting workers to use at home or in remote offices. Even home offices benefit from the advantages of WI-Fi technology. As you work from the comfort of your home office, you can connect your PC, printer, scanner, smart phone, audio/video equipment and other wireless devices with a single access point. All accomplished without a lot of wires running under your desk. No cables to mess up the home so the spouses are happy as well. Their home is not messed up with extra cables and yet they have the benefit of their husband or wife to work at home. If you have comments about this post or WiFi in general , please feel free to leave a comment. All well written comments with content that will benefit our readers will be approved. Even comments with links will be approved if there is a constructive well written comment to go with it about this post. The short answer in a summarized version re how does WiFi technology work is as follows. Wi-Fi networks use radio technologies in the 2.4 and 5 GHz radio bands. It is defined by a standard called 802.11 . The objective is to provide secure, reliable, fast wireless connectivity. It should be without the need for cumbersome wires in homes and hard to get to business areas. A Wi-Fi network in the home or office can be used to connect electronic devices to each other. Also to the Internet, and to wired networks which use Ethernet technology. Why is Wi-Fi so Attractive? Wi-Fi in the home is welcomed by many consumers. Now they do not have to run unsightly wires around their home. These run from the cable modem or telephone modem to their computers. Home owners love this concept since they can roam around with their smart phones or portable computers all over the house. They can go even the back yard and still use their Wi-Fi connection to send and receive data. Note that most smart phones have the option too use network data or data services provided by the wireless companies. This is usually expensive. It comes with limits in terms of how much data you can send and receive. Using your Wi-Fi connection, means that you are using the data connection supplied by a cable company or the telephone company usually at much lower rates. Most cable companies and telephone companies offer a combined modem and Wi-Fi device which is hooked up to the cable that enters your home. If you can try to locate this device in a central location in your home and not in the basement. this will ensure that you have good wireless reception throughout your home and even outside in your yard. The data signal transmitted over the cable is reconfigured from a wired data signal into a wireless format and transmitted over the air for a limited distance which is usually sufficient to cover your home and yard. The installer will configure the wireless modem for you, however most now are so simple and straightforward that they self configure themselves. The only step you must do is to first decide if you want your wireless network password protected or not and secondly configure your computer and smart phones to access your wireless network. One of the basic decisions is whether you want to leave your Wi-Fi network in your home open to anyone accessing it or if you want to password protect it. If you password protect your network it means that only those people you give the password too can use your network. For example, a friend of mine does not even have a data connection at his home. Instead he uses his neighbors open wireless network! I have also driven around urban streets to see how many open vs. protected networks there are and have been able to access quite a few. We strongly suggest that you password protect your wireless network! There was a recent news report where someone hacked into a person’s home network and started talking to their baby over the wifi based baby monitor. Talk about a scary thing. Make sure you use a strong password and password protect everything. When you connect your smart phone or computer to the network via Wi-Fi, you will have to have a Wi-Fi modem in your computer which most do these days. Once you start the application for wireless connection you will be presented with a number of wireless networks that are available in your area. Select yours. If it is password protected, you will be asked to enter the password in order to access it. From that point on your computer will remember the password. This post has focused in a non technology oriented way, how does Wi-Fi technology work. Our next couple of posts are going to focus specifically on the home. Also on the business applications of Wi-Fi. Watch for Is Wi-Fi for me? At Home? and Is Wi-Fi for me? For my business? With all of these new technologies and acronyms, consumers are having a difficult time keeping up. What is WiFi? Wi-Fi is one more that benefits many consumers in their homes as well as at the office and the coffee shop. Wi-Fi is a technology that eliminates the cable or wire between your computer and the modem that sits in your home which the cable or the telephone wires are attached too. If you have a smart phone that is Wi-Fi capable it also can take advantage of the wireless access in your home or at the office and coffee shop. Wi-Fi eliminates the need to find a wired network connection. While this is a great step forward with no more wires running around your home, you still need to understand how to program your computer or smart phone to take advantage of the Wi-Fi wireless network. Every device is different, although most are intuitive and easy to set up. Ask the sales person to walk you through the set up procedure so that you can set up your computer or smart phone on your wireless network when you get home. The following provides a little more information for the average consumer. For most people, you just want to know that it works and these devices today are so user friendly that most people can set them up easily in their own home. Just follow the instructions that come with the device and you should be good to go. Read on for more info about Wi-Fi. we will also be adding additional posts about how W-Fi is used in the home and in the office as well. For the average person, Wi-Fi technology is basically a box that has one or more antenna’s on it, sometimes they are inside the unit. This unit is usually attached to a cable modem for example or more often now, manufacturers are combining the cable modem and the Wi-Fi terminal in one box to eliminate even more wiring and cost. Position the Wi-Fi terminal in a relatively central location in your home, in an out of the way location and you will have uniform wireless coverage through out your home. Same applies to the office, although you may end up having more than one Wi-Fi device if it is a large office. Once installed and connected, you can send and receive all of your usual email, data, video etc via your Wi-Fi device. These devices save hundreds and sometimes thousands of dollars in cabling that is no longer needed. All major communications suppliers including the cable companies and the telephone companies now offer Wi-Fi terminals for your use, usually combined with your standard monthly data service. Wi-Fi products operate over a specific set of radio waves. In the same way as your cell phone, garage door opener, TV, radio, GPS navigation system or microwave. Each of these types of products have been designed to operate in a specific frequency band of the radio spectrum to ensure that there is no interference between them. Wi-Fi products operate in the 2.4GHz or 5GHz bands. Most radio bands require a license from the government. Not so with Wi-Fi. These bands are designated as “license-free”. This indicates that individuals may use products designed for these bands without a government license. A great deal of coordination in the design of these devices with other products has taken place. This is needed to ensure that there is no interference and all manufacturers must adhere to these rules. For the average consumer, you just need to know that this is all taken care of. They will have no impact on anything else in your home. Standards bodies control the design of all products in the world. Each design, in this case for Wi-Fi receives a designation. Wi-Fi products are identified as 802.11. They are then further identified by a lower case letter that identifies which specific technology is in operation. Each specifies a set of features that relate to performance, frequency and bandwidth. When you purchase a Wi-Fi device, you want to make sure that device is compatible with the latest Wi-Fi standard. Most new devices are tested to ensure they are back word compatible. In other words that they will work with older devices. There is a limit to this. Even though you may not have the latest Wi-Fi compatible software on your computer for example, it may still work. You can just try it and see or compare the specs for the Wi-Fi device you are buying. For most people this is way too much information and complexity. 99% of all new computers are equipped with the latest Wi-Fi technology.